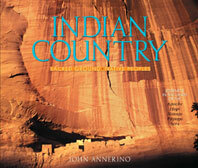 In the land inhabited for millennia by the Hopi, Navajo, Pápago, and Apache—and with the help of native leaders, who guided him to hallowed, secret places—Annerino scaled 13,000-foot mountain summits and descended into shadowy caves; he traced the footsteps of legendary warriors to granite strongholds and traced the handprints of ancient ancestral shamans on cliff walls. Along the way he chronicled his astonishing pilgrimage, capturing in remarkable photographs and evocative words a world that few of us have been privileged to glimpse, let alone partake in. Many of the lofty spires, towering monuments, and deep canyons that Annerino explored throughout the Great Southwest are familiar sites from Hollywood westerns and are sought out by avid climbers. 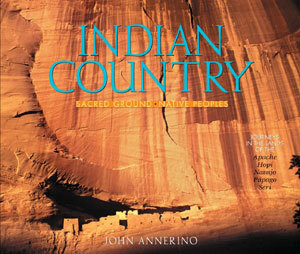 But these sites are sacred ground to native peoples, and it is that venerated identity that Annerino experienced and conveys in Indian Country. His photographs and essays pull back the curtain on a timeless world and reveal some of the mysteries to be found within.